My sugar free journey started about 2 years ago when I went to a Functional Dr who diagnosed me with candida overgrowth. Which, in combination w/ hypothyroidism, was a major cause for some awful fatigue at the time. Getting off sugar and treating the candida made such a big difference in how I felt and functioned on a daily basis. About a year in to the treatment I thought I had it beat, but it flared up again and so I put myself on a super low carb diet for 4 weeks. Around that time, I learned about the ketogenic diet and when I looked at my macros, I was REALLY close already. So I tweaked my fat and protein and easily went into ketosis. I’m eating keto mostly for its promise for hormone healing and it has definitely helped me! My goal is to get fully off my thyroid meds. My levels have already improved so I’m currently at half the dose I was previously! Super excited about that, though my hormones are not super happy about the lower thyroid dose, so my body is currently recalibrating. Its seems that a health journey never truly ends. But, I’m determined to heal my body and I truly believe in food as medicine. So all of that to say that in the past 2 years, desert has not been a big part of my life. I was never a big dessert person anyway (don’t need it everyday after dinner). But from time to time, I really miss a few things. Especially ice cream in the summer! I’ve been dairy free for around 7 years but I used to be able to eat the store-bought stuff. Since going sugar-free, I just can’t find an ice cream in the store that I can eat! So I bought an ice cream maker and I’m experimenting! And WOW, I hit the nail on the head w/ this one! Its made completely out of coconut milk, but w/ the vanilla flavoring, you can barely taste the coconut. It’s just YUM! Tonight I was also really craving something chocolate. 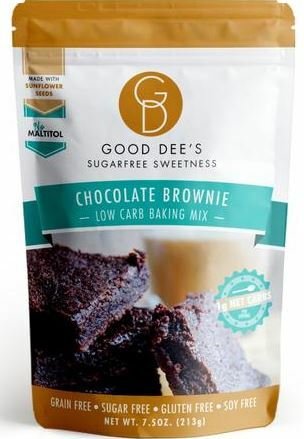 I just love Good Dee’s products. 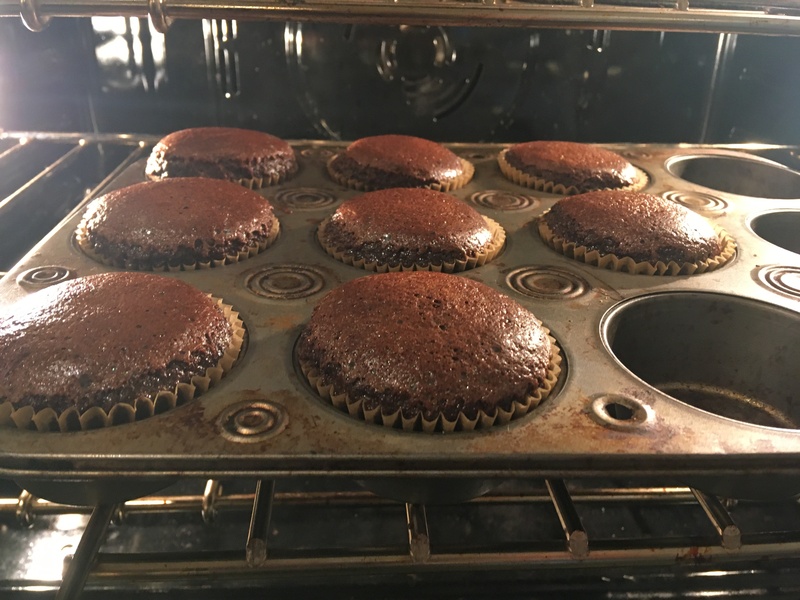 Her low carb brownie mix is just fantastic! She uses sunflower seed flour as the base for these. I tried something different and baked them in muffin cups. Actually, it was really just me being lazy and not wanting to cut waxed paper for the brownie pan. 😉 But it worked out great! 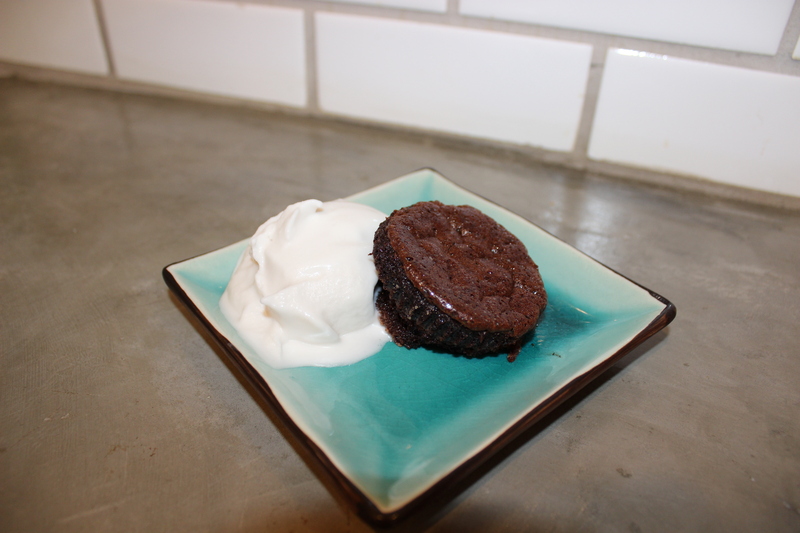 I should have let them cool more before removing from the paper, but who can resist a hot brownie w/ ice cream??! I hope you enjoy this ice cream as much as my family and I did. So rich and satisfying! It would be even better w/ real vanilla bean! Feel free to play around w/ other flavors – like cinnamon or pumpkin pie spice. You could even blend in some fresh fruit. 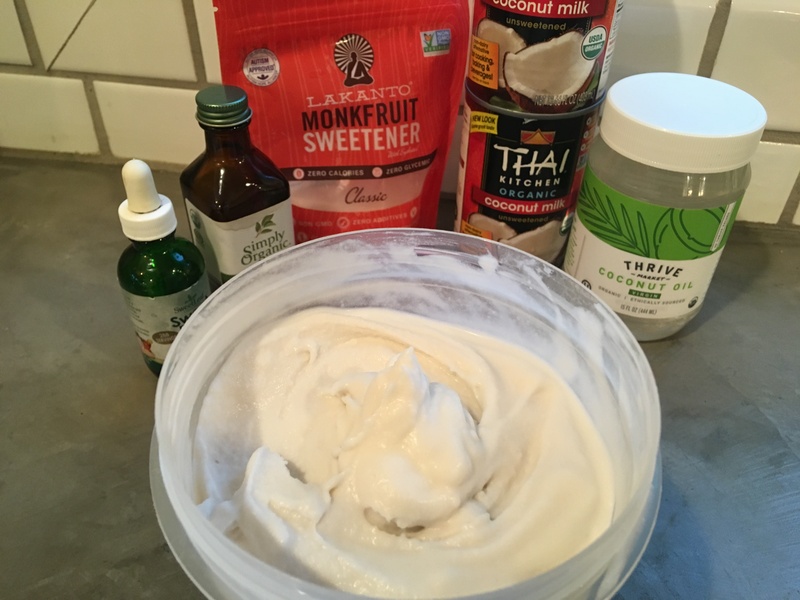 2 cans (13.66 oz) full fat coconut milk (I used Thai Kitchen b/c its super thick, but if you are avoiding gums, any full fat version should work. To a high speed blender (like a Vitamix), add all of the ingredients listed above. Blend on high for approx 30 seconds. Make sure your ice cream maker is set up per the manufacturer instructions. Instructions below are for the Cuisinart ICE-21R Ice Cream Maker. Place fully frozen bowl onto the base and assemble the paddle and cover. Turn the ice cream maker “ON”. Pour the mixture from the blender into the frozen bowl. Let run for 15-20 minutes, checking every 5 minutes or so. 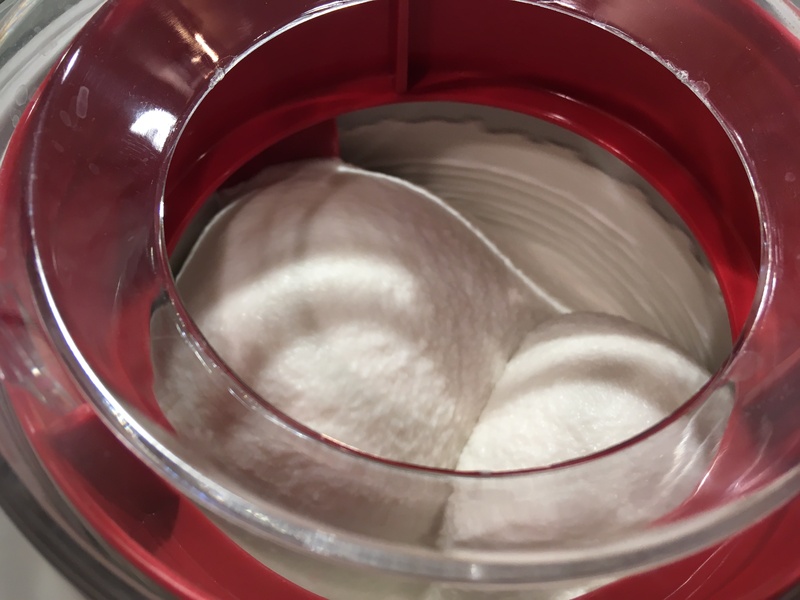 When ice cream looks like a soft serve, stop the machine. Scoop out the ice cream into a freezer-safe container and place in freezer. If you can wait, let it set up in freezer approx 15 minutes, stir and return to freezer for another 15 minutes. Serve after it sets up (or right away if you don’t mind a softer ice cream). Top w/ fresh fruit, over a Good Dee’s treat, nuts, or anything your heart desires. It tastes a LOT more like sugar than stevia. It does have a few carbs (only a concern if following a strict low carb diet) but for most its not enough to worry about. Let me know how you like it!